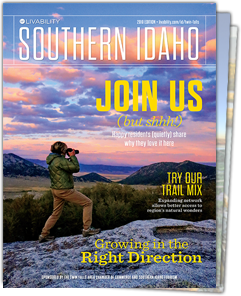 The Visitor Center provides information and inspiration for visitors to Southern Idaho. The center includes a large souvenir and gift shop featuring locally-sourced products. There are also a variety of exhibits showcasing the natural features and history of the region. An interpretive center includes a display of the historic I.B. Perrine stagecoach, exhibits about the agricultural history and geology of the Snake River Canyon, as well as photographs and information about the abundant recreational opportunities the area has to offer. The Center also serves as a centralized location for exhibits about the Hagerman Fossil Beds National Monument, Minidoka National Historic Site, Craters of the Moon National Monument and City of Rocks National Reserve. Enjoy relaxing on the lawn surrounding the center, easy access to the extensive developed trail system and scenic overlooks along the Snake River Canyon Rim or watch BASE Jumpers as they parachute from the 486-foot-tall Perrine Bridge.